PRETORIA, South Africa, April 26, 2015 (ENS) – South Africa’s Department of Environmental Affairs has released for public comment its first-ever Biodiversity Management Plan for lions, panthera leo. While African range lions have declined over the last several decades, especially in west and east Africa and in southern Africa, where they were extirpated from most of their range by the 1900s, South Africa’s lion populations have not only stabilized but are increasing – by 30 percent over the last three decades. Although wild lion population numbers are dropping across the continent, the Department of Environmental Affairs recommends that lions in South Africa be downgraded on the IUCN’s Red List of Threatened Species from the current classification of Vulnerable to extinction to a classification of Least Concern. Dr. Pieter Kat a trustee with LionAid, a UK charity working globally to save lions, is critical of the management plan. 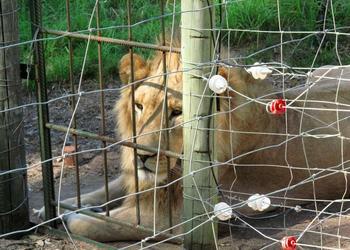 “This is clearly to facilitate trade, to the detriment of wild lions in South Africa,” he said. There are currently 2,300 wild lions in the various national parks and 800 “managed wild” lions in smaller reserves, according to the Biodiversity Management Plan. The plan recommends the downlisting because there are about 1,600 mature individual lions in South Africa, and it maintains that when the population of mature wild lions tops 1,500 individuals, the IUCN’s Red List should change the status of the species. But South Africa does not know how many wild lions there are says Dr. Kat. The last lion survey was in Kruger National Park in 2005/2006, so that data is now almost 10 years old. “You cannot use it in any management plan as it is well beyond the ‘sell by’ date,” he said. The Biodiversity Management Plan notes that there are around 6,000 captive-bred lions throughout the country, bred “exclusively to generate money” and that the captive breeding and subsequent release for hunting of captive bred lions remains legal. South Africa is the only country in the world that has three classifications for lions: wild, managed wild and captive bred. 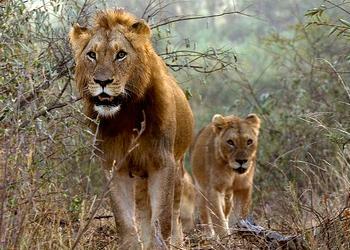 Asian traders started taking an interest in South African lions in 2008, when the decline in tiger numbers became acute. In traditional Chinese medicine, tiger wine and cake, made using powdered bones, allegedly cures many ills including ulcers, cramp, rheumatism, stomach ache and malaria. Lion bones are now filling the gap and, according to the Biodiversity Management Plan, there is a sharp increase in lion products sold in Vietnam, Laos and China. The agency says 739 kilograms of lion bones were legally traded to Asia in 2012 as compared to just 55 kilograms the year before. The Biodiversity Management Plan views a legal trade in lion bones as an economically viable activity and hopes to “promote sustainable legal trade in lions and lion products” using a regulated permit system. 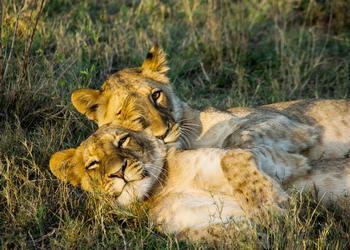 The sale of lion products, especially lion bones, offers breeders a way of boosting their earnings. A breeder can get paid anywhere from US$5,000 to US$25,000 per lion shot, but can boost his earnings by selling a lion skeleton, worth between $1,000 and $2,000 to a Chinese dealer in Durban or Johannesburg. The skeleton, once boiled down and bottled in Asia could reach a value exceeding US$20,000. He points out that there is already significant evidence that lions are being poached for their skins and bones in Zimbabwe and Tanzania, and trophy hunting operators outside South Africa have already been approached to sell the lion bones. He says it is a short step from there to middlemen arranging for communities to poach and sell lion bones. The public is invited to comment on the lion Biodiversity Management Plan before May 17, however, adequate alternatives should be provided to each objection raised or the government’s response may be that the objections were noted – but ignored.